CodeTrack™ is simply code enforcement made easy. This advanced system was designed for the professional who demands the finest software available which combines flexibility, advanced features, and integration into one package. Our growing list of customers demonstrates our commitment to service and quality. CodeTrack™ offers investigators the ability to organize and protect data, assign cases, and audit active investigations. Create accounts which can track contacts, evidence, specific violations, photos, general location and create your own custom fields. Track specific incidents through our case manager. Assign cases to officers, schedule follow up times, set the case activity level. Create unlimited Notes, Contacts, Linked Files, Violations on cases or accounts. We’ve produced a pocket-sized CodeTrack™ with field deployment in mind. 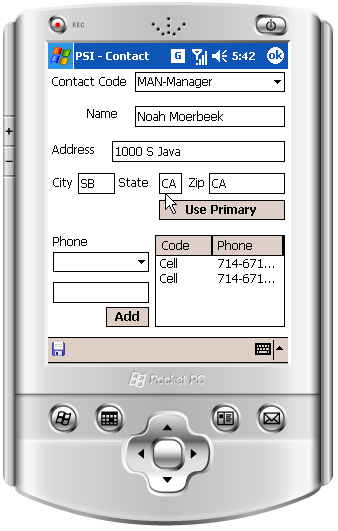 Like our other mobile products, CodeTrack™ Mobile runs on the .Net Compact Framework 2.0 and Microsoft®’s SQL Server Compact Edition, allowing us to squeeze unbelievable power into such a small device. Superior interface facilitates training new employees. Offers integration with PSI’s parcel management solution. Virtually unlimited search methods for retrieving desired cases. 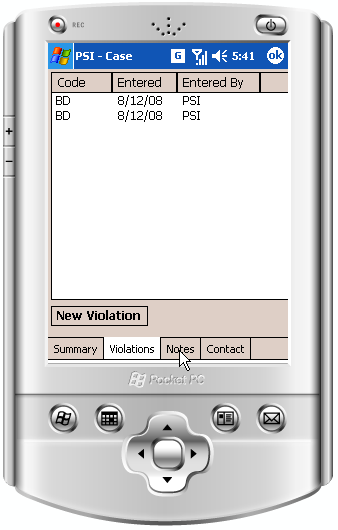 Create a full report on a code enforcement action with notes, violations, pictures and history with a single click. 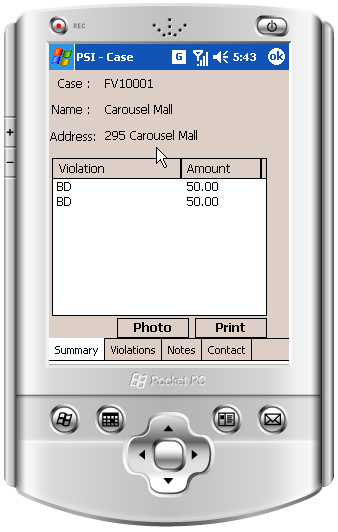 Generates invoices, forms, custom correspondence and notifications. Offers industrial grade mobile unit capable of creating violations and taking evidence in the field. Maintains easy to read historical log of all transactions with point and click reprint capabilities. User definable code enforcement process for each case type. Facilitates paperless inter-departmental signoffs to facilitate case closure. Automatically assign code enforcement officers based upon user defined criteria (such as geographic criteria). Effectively manage cases for multiple officers. All cases may be optionally accessed via the internet or via CodeTrack.™ High priority cases may also be emailed to the field for immediate attention. Direct integration with Microsoft® Outlook. Case information can be viewed from PSI’s LicenseTrack™ Business Licensing System. Complete integration with PSI’s PaymentCentral cashiering software. Payments may be accepted via the web using our optional web payment module. CodeTrack™ is a true client server application. It is written using C++ to obtain the maximum speed and flexibility possible. CodeTrack™ complies with the Open Database Connectivity (ODBC) technology that allows CodeTrack™ to utilize any ODBC compliant database. Efficient program and database design allows complete scalability from small single-user to large enterprise-wide operations.